A poncho makes a great cover-up for chilly weather, especially when it's made out of cozy fleece fabric. 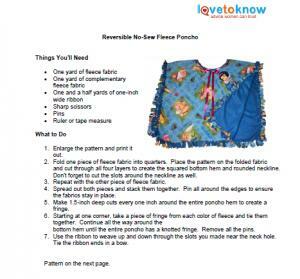 Although it may seem like an intimidating project, you don't even need to get out your sewing machine to make a poncho. This free no-sew pattern makes it fun and easy. Print this no-sew poncho pattern. This easy pattern is perfect for making a warm, reversible fleece poncho. Choosing two different, but coordinating, fleece fabrics allows you to create two different looks. For even more versatility, you can also wear the completed poncho with the pointed ends facing front and back as shown in the picture below, or fold it as shown in the picture above for a straight-across look. Making this poncho is easy and will take you about an hour. Click on the image of the pattern to download it to your computer. Enlarge the pattern and print it out. Fold one piece of fleece fabric into quarters. Place the pattern on the folded fabric and cut through all four layers to create the squared bottom hem and rounded neckline. Repeat with the other piece of fleece fabric. Spread out both pieces and stack them together. Pin all around the edges to ensure the fabrics stay in place. Make 1.5-inch deep cuts every one inch around all four sides of the poncho hem to create a fringe. Starting at one corner, take a piece of fringe from each color of fleece and time them together. 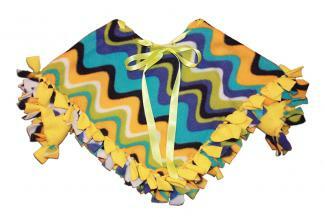 Continue all the way around the bottom hem until the entire poncho has a knotted fringe. Remove all the pins. Use the ribbon to weave up and down through the slots you made near the neck hole. Tie the ribbon ends in a bow. Cut a collar out of the polar fleece and use hot glue to affix it to the poncho neckline. Create a fabric flower brooch and hot glue it near the neck of the poncho or on one shoulder. Purchase a fun trim and hot glue it about one inch above the fringe all the way around the poncho. Cut out an applique and use hot glue to attach it to the poncho. Be precise in your cutting. Uneven edges or a wavering hem will make the results look less professional. If you're having trouble getting a uniform look for the fringe, apply a piece of masking tape 1.5 inches from the raw edges to use as a depth guide. Cut the fringe on both colors of fleece at the same time. That way, you'll know that the fringe will line up all the way around the poncho. Take your time. Rushing, especially when it comes to cutting the fringe, can lead to mistakes. 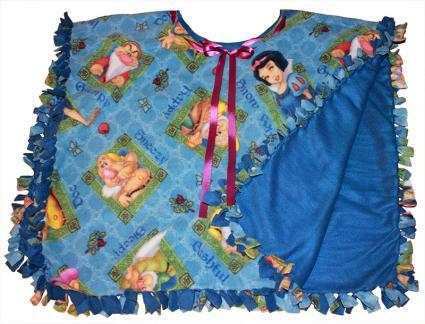 Polar fleece is a great fabric for easy, no-sew projects, from ponchos to hats. Because the edges don't unravel, it's a dream to work with and always yields beautiful results. Take your time and have fun making something cozy to wear when the weather turns chilly.